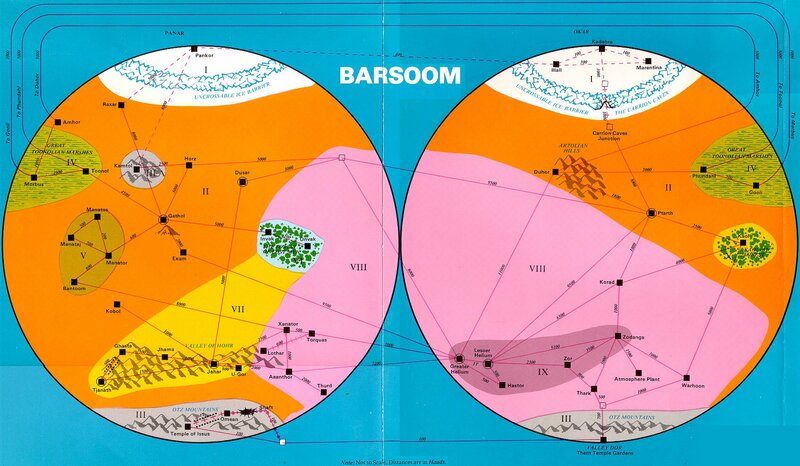 We come to the Fourth Wonder of Barsoom, the splendid gleaming white city of Kamtol in the great rift Valley of the First Born, aka The Black Pirates of Barsoom. The Firstborn are, of course, the dominant race of Barsoom, the opposite case of that which existed on Earth at the time ERB first wrote about them. 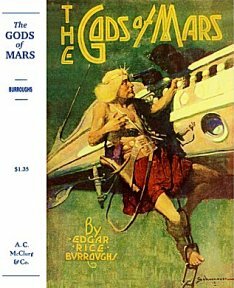 When he first introduced the First Born in The Gods of Mars to the reading public in 1913, it must have caused a sense of outrage to the uninhibited white racists of the day, those that otherwise would have enjoyed that John Carter was from Virginia and a nonabolitionist on Mars. ERB enjoyed poking fun at race, religion, mores, and culture in all of his stories, always challenging the delusion of absolute belief in anything. This is why he had such a wide appeal. ERB also tackled a really intriguing concept in the Master Machine of Kamtol, a machine that allowed its tyrant, Doxus, to rule out of absolute terror. 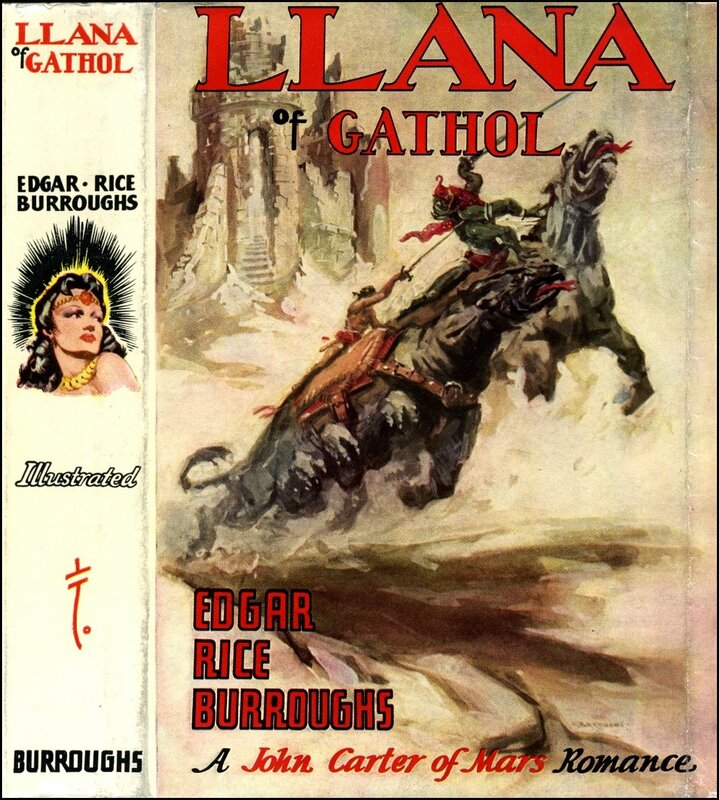 Let us see how ERB developed this concept in “The Black Pirates of Barsoom,” the second installment of Llana of Gathol. “I was in the lead, when I came upon a human skeleton. It was crumbling to dust, an indication that it must have lain there for many years, for so low is the humidity on Mars that disintegration of bony structures is extremely low. Within fifty yards I came across another skeleton and after that we saw many of them. It was a gruesome sight and what it portended I could not guess. At first I thought that perhaps a battle had once been fought here, but when I saw that some of the skeletons were fresh, and well preserved and that others had already started to disintegrate I realized that these men had died many years apart. “At last I felt that we had crossed the line of march of the caravan and that as soon as we had found a hiding place we would be comparatively safe, and just then I came to the edge of a yawning chasm. “Except for the Grand Canyon of the Colorado, I had never seen anything like it. It was a great rift valley that appeared to be about ten miles wide and perhaps two miles deep, extending for miles in either direction. “The trail was steep and oftentimes dangerous for it zig-zagged down the face of an almost perpendicular cliff. Occasionally on a ledge we would have to step over the skelelton of a man, and we passed three newly dead bodies in various stages of decomposition. “‘What do you make of these skeletons and bodies?’ asked Pan Dan Chee. “‘But how do you suppose they met their death?’ asked Llana. “From our dizzy footing on that precarious trail we had an excellent view of the valley below. It was level and well watered and the monotony of the scarlet grass which grows on Mars where there is water, was broken by forests, the whole making an amazing sight for one familiar with this dying planet. “There are crops and trees and other vegetation along the canals; there are lawns and gardens in the cities where irrigation is available; but never have I seen a sight like this except in the Valley Dor at the South Pole, where lies the Lost Sea of Korus. For here there was not only a vast expanse of fertile valley but there were rivers and at least one lake which I could see in the distance; and then Llana called our attention to a city, gleaming white, with lofty towers. “We stood for some time on a ledge looking down upon that beautiful valley, probably one of the most beautiful sights on all of Mars. We saw several herds of the small thoats used by the red Martians as riding animals and for food. There is little difference in the saddle and butchering species, but at this distance we could not tell which these were. We saw game animals down there, too, and we who had been so long without good meat were tempted. “I was taken to an apartment and seated in a chair with my back toward a strange looking machine, the face of which was covered with innumerable dials. A number of heavy insulated cables ran from various parts of the apparatus; metal bands at the ends of these cables were clamped about my wrists, my ankles, and my neck, the latter clamp pressing against the base of my skull; then something like a strait-jacket was buckled tightly around me, and I had a sensation as of countless needles touching my spine for almost its full length. I thought that I was to be electrocuted, but it seemed to me that they took a great deal of unnecessary pains to destroy me. A simple sword thrust would have done it much more quickly. “‘The machines to which you were connected recorded hundreds of your reflexes; and automatically recorded your own individual nerve index, which is unlike that of any other creature in the world. “‘But why all that just to destroy a few slaves?’ demanded Pan Dan Chee. “‘Why couldn’t it be replaced?’ asked Llana. “Since I have already compared myself to a prospective Derby winner, I might as well carry out the analogy by describing their Lesser Games as minor race meets. They are held about once a week in a stadium inside the city, and here the rich nobles pit their warriors or their slaves against those of other nobles in feats of strength, in boxing, in wrestling, and in dueling. Large sums of money are wagered, and the excitement runs high. The duels are not always to the death, the nobles deciding beforehand precisely upon what they will place their bets. Usually it is for first blood, or disarming; but there is always at least one duel to the death, which might be compared to the feature race of a race meet, or the main event of a boxing tournament. “I had been practicing him in disarming an opponent, when a door opposite that which we had entered the room opened; and a man came in. During the brief time the door remained open, I saw beyond it a brilliantly lighted room; and caught a glimpse of what appeared to be an amazing complicated machine. Its face was covered with dials, buttons, and other gadgets – all reminiscent of the machine to which I had been attached during the weird examination I had received upon my entry to the city. “At sight of me, the newcomer looked surprised. Here was I, a total stranger and evidently a slave, facing the Jeddak of the First Born with a naked blade in my hand. Instantly, the fellow whipped out a radium pistol; but Doxus forestalled a tragedy. “‘A slave escaped last night,’ said Myr-lo. “‘Who is Myr-lo?’ I asked. “‘Does he live in the palace?’ I asked. Carter uses his freedom of the city to his advantage, being treated with great respect by the people as a great swordsmen is held all over Mars, comparing this respect to that of a Juan Belmonte in Spain or a Jack Dempsey in America. While on an outing one day he espies a number of fliers over the city, which takes him by surprise. He knows that the First Born in the Valley Dor had been flying men, but up until now he had seen no evidence of fliers in Kamtol. “As I opened the door into the larger room, Myr-lo arose from the couch and faced me. “‘What are you doing here, slave?’ he demanded. “Here was a pretty pass! Everything seemed to be going wrong; first, the summons to the banquet hall; then Zit-had, and now Myr-lo. I hated to do it, but there was no other way. “‘Draw!’ I said. 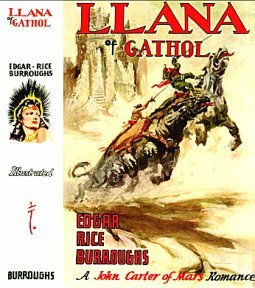 I am no murderer; so I couldn’t kill him unless he had a sword in his hand; but Mry-lo was not so ethical – he reached for the radium pistol at his hip. Fatal error! I crossed the intervening space in a single bound; and ran Myr-lo, the inventor of Kamtol, through the heart. “Without even waiting to wipe the blood from my blade, I ran into the smaller room. There was the master mechanism that held two hundred thousand souls in thrall, the hideous invention that had strewn the rim of the great rift with mouldering skeletons. 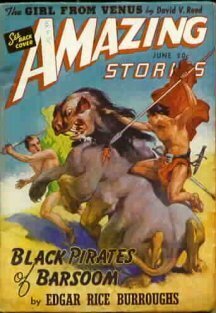 Carter covers his body with the black cream, removes and puts on Myr-lo’s harness, and then disguised as Myr-lo, makes his way back to the hangar. He steals a fine flier, rescues Llana just in time from the clutches of Nastor the Dator, swoops down into the square, picks up Pan Dan Chee and Jad-han, and flies over the escarpment and out of the Valley of the First Born. A. Location of the Valley of the First Born. 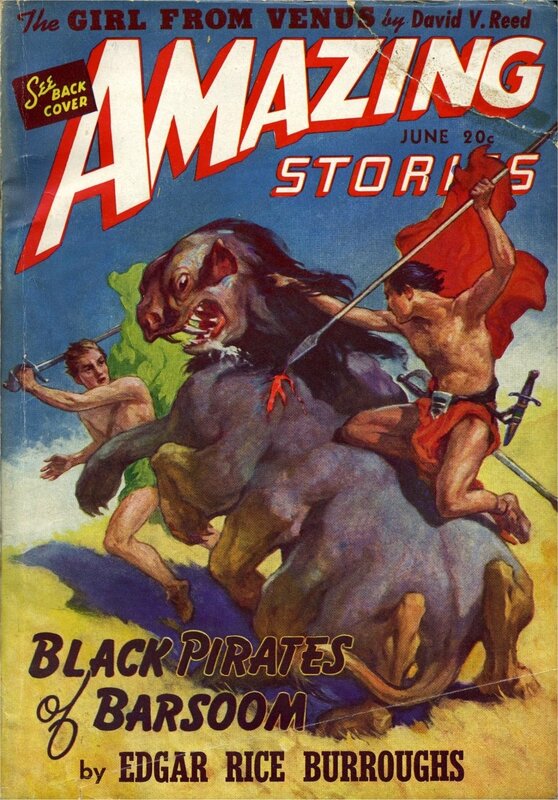 At first it might be hard to believe that the Great Rift Valley of the First Born would have been unknown to the Red Martians since it lies about halfway between Horz to the north and both Manator and Gathol to the south. (See the wonderful maps posted at ERBzine #2807 | ERBzine 3041 .) On closer examination, however, it appears that most of the Red Martians live south of the equator, since that is where the last great ocean, Throxeus, eventually dried up. We know the Orovars built their cities on the edges of this great ocean, and from the location of Horz and Lothar, as well as the Great Toonolian Marshes – all that remains of this once mighty ocean – we can get some idea of the boundaries of this great sea. Before the advent of the canals, the Red Martians would have followed the water, and thus most of the population ended up in the Southern Hemisphere of the planet, where the River Iss led inevitably to the South Pole and the horrible death in Martian Heaven at the hands of the Plant Men and Great White Apes in the Valley Dor. Thus, it is little surprise that both the Orovars in Horz and the Great Rift Valley of the First Born would not have been discovered until Carter stumbled upon them. Besides, both the Orovars of Horz and the First Born of the Rift Valley kill or take slaves anyone who is found within their boundaries, thus leaving no one to report their existence. ERB was always careful that his descriptions never varied from book to book, as made clear in long repetitious passages that are nearly word for word in each story. So why did he change the hair color of the ancient white race from auburn to blond? My theory, and it is only that, is because his wife at this time, Florence, and his adopted daughter, Carol Lee, both were blue-eyed blondes. As he had incorporated his family into the stories in the past, he continued to do so in his new marital situation. If someone else has a better theory, I would like to hear it. 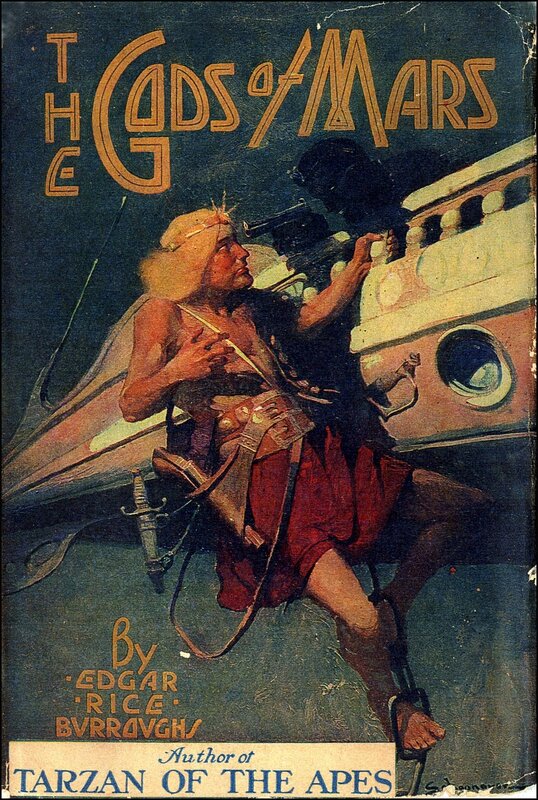 1941 was a golden year for classic science fiction. Robert Heinlein achieved fame for his short story, “Logic of Empire,” published in the March 1941 edition of Astounding Science Fiction. Issac Asimov wrote one of his signature stories, “Nightfall,” as well as “Source of Power,” the fourth story in his positronic brain robot stories – also appearing in Astounding. Thus, I am not able to say with any expertise that ERB was the originator of the nerve index concept. I do know, however, that countless variations of it have appeared in science fiction literature and films since then. I also know that the idea of state-sponsored mental terrorism is as old as Hebrew science fiction as we find it in the story of alien beings, to wit, angels, giving the Ten Commandments to Moses, especially the last two “Thou shalt not covet” commandments that make natural mental thoughts a sin. Not to forget the modern classics like Orwell’s 1984, where Thought Crime can get you arrested by the Thought Police and sentenced to the infamous Room 101. But the Master Machine and the Individual Nerve Index is frightening in a whole new way, for at any time at the tyrant’s whim, your own mind and body can be the source of your own demise, and one can unwittingly become one of the “Myr-lo’s babies.” I believe this is one of ERB’s major contributions to the body of classic science fiction and he should be given due credit for it. Kamtol and the Valley of the First Born!